Libertarian congressman Justin Amash: Critic of NSA, immigration, budget deal. The libertarian congressman on NSA, immigration, and the year’s best video game. Justin Amash kicked off 2013 with an act of pointless, doomed rebellion. The congressman from Michigan, a Republican first elected in 2010, had just been removed from the budget committee, a long-delayed comeuppance for his opposition to the Paul Ryan budget. (Like many libertarians, he didn’t think it went far enough.) He talked freely to reporters about the snub. After the new Congress was sworn in, Amash joined a crew of conservatives to vote against John Boehner for Speaker of the House. Amash was famous—and among establishment Republicans, notorious. “Even I’m sick of seeing myself in the paper,” he told a reporter. Not that sick, though. By the summer, Amash had normalized relations with his leadership and won a vote on an amendment to defund the NSA’s domestic surveillance. When the amendment nearly passed, it altered the way official Washington discussed the NSA, changing the story from senators vs. Snowden to an actual controversy that ran through party lines. Three months later, the 33-year old congressman drew a wealthy and establishment-friendly Republican primary challenger. This was covered as a problem for the Tea Party, but it seemed awfully selective. Of all the “unreasonable” Republicans to go after, the one sweating a challenge was the libertarian who explained his votes on Facebook. 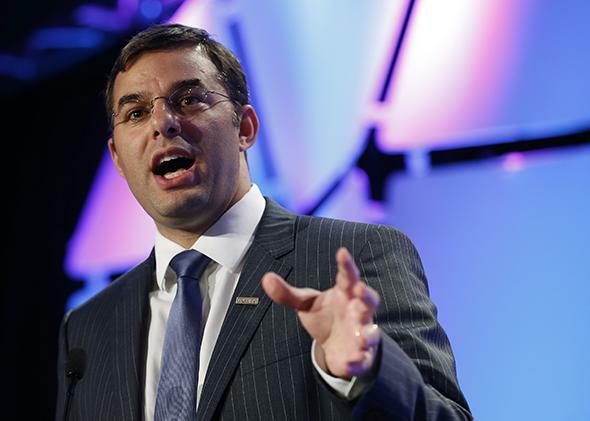 I talked to Amash about the year that was and how he expects 2014 to play out. David Weigel: Your biggest legislative coup this year was a loss—the NSA amendment that went down narrowly. You’re bringing it up again in 2014. Why would it go differently next time? Justin Amash: Well, things are going great. The recent court ruling, and the recent push by many of the tech companies puts things firmly on our side going forward. Actually, I’ve heard from many people about their votes next time, and one of the more prominent members of Congress who’s changed his mind on this is Chairman [of the House Oversight and Government Reform Committee Darrell] Issa. As he’s learned more about it, he’s come to the conclusion that the NSA has to reform the way it operates. DW: How did this week’s NSA decision move the votes? JA: What I took out of the court ruling was that it emphasized a lot of the points that I’ve been making over the past several months—that in the modern era, if the third party doctrine is applied as it was applied in Smith v. Maryland and extended to modern technologies, the entire Fourth Amendment is wiped away. And the ruling made the very clear case that I’ve also been making, that Smith v. Maryland is not really on point. DW: It’s not now or it never was? JA: It’s not now. I don’t think it was a very strong ruling at the time, but it’s certainly not applicable to modern surveillance issues. I expect we’ll have an opportunity to look at this over the next several months. The Judiciary Committee sounds like it really wants to move forward with legislation. It’s pretty clear that most members of Congress are in the USA Freedom Act camp. DW: How much do you think this year’s NSA leaks moved people on spying? Was this sort of skepticism endemic and it just needed an outlet, or is it new? JA: There’s always been a fair level of mistrust in government. It’s part of our nature, here, as Americans. And that’s good. It’s part of the reason why we started our constitutional republic. But it’s been heightened in recent years, and part of the reason is that technology has really eroded the privacy of so many people. If the government has access to all of our data, we have no privacy anymore. DW: Have you changed the way you protect your data? Do you have a VPN or something? You do post a lot on Facebook, which isn’t the most privacy-friendly space. JA: I take the steps I think are appropriate. DW: You were just telling constituents at a town hall meeting that the budget deal was lousy because it didn’t “compromise.” We’re all covering it, in the media, as a compromise. So what did you mean? JA: I’ve always said I’m willing to consider anything provided that Democrats are willing to consider Social Security and Medicare. Come on, let’s get together and put everything on the table, let’s have a discussion, because we can’t continue the way we’re going. The budget deal didn’t change that direction. It wasn’t as if we were making small improvements. That’s not what I voted against. DW: So, why did it happen, who do you blame? JA: There’s just a reluctance to compromise. The deal is the product of two parties that are unwilling to compromise. One side says, we’re unwilling to compromise on military spending; the other side says, we’re unwilling to compromise on Social Security and Medicare. So the deal was to do nothing. DW: This feels like less than Republicans told themselves they would get when the year started. Not long ago, you had the president on the record to put Social Security cost of living adjustment in a deal. JA: I think that’s true. Expectations have changed as time has gone on. In fact, we were assured that the sequester would not be changed unless we were able to get major reforms to entitlements. After the Budget Control Act passed in 2011, that was the assurance made to us. Before the vote on the BCA, I remember standing up in conference prior to that deal, and asking our leadership: What if two years from now you decide, or Congress decides, to undo the sequester without compensating with Social Security and Medicare reforms? And the leadership told me, for that to happen, Republicans would have to go along with it. Do you really think that’s going to happen? DW: It was a rhetorical question? JA: Oh, they said to me, do you think that’ll happen—as if there was no chance whatsoever that it could. DW: Did you speak up this time? JA: I could see the direction things were going. I took a more low-key role. DW: So, what do you want to be attached to the debt limit when it comes up again? JA: I’d like to see major reforms to the largest spending programs. That might include Obamacare, but it’s also going to include Social Security and Medicare and military spending. DW: Paul Ryan came to your district this year to talk about immigration reform. We’re done for 2013; immigration reform hasn’t happened. Are you disappointed? JA: Yeah. You have to have immigration reform. It’s disappointing, it’s unfortunate. Part of the problem is the breakdown of trust between the White House and particularly Republicans in Congress, so that many Republicans who were supportive of reform have backed away because they no longer trust that the president will faithfully execute the laws. DW: Does that include you? JA: Well, I am more skeptical of the process now then I was several months ago. It’ll take a lot of work to get to me the point where I could trust President Obama to enforce the laws we’ve passed. I’m concerned about that. This president certainly hasn’t been shy in taking the law into his own hands when it doesn’t comport with his views. So I’d like to see immigration reform but trust has to rebuilt between the sides, and it has to be immigration reform that is beneficial to Americans on the whole, beneficial to our country, provides adequate border security. DW: To what extent are your colleagues moving on from immigration reform because the Democrats are hurting now, and it doesn’t seem like the GOP needs to win Hispanic votes in 2014? JA: It wouldn’t surprise me if some people believed that, but if we’re going to be a party that represents the entire country we have to be welcoming to people from all backgrounds. I think that means some reforms to our immigration system. DW: Washington and Colorado legalized marijuana this year and didn’t collapse into dystopian nightmares. You’ve reintroduced a bill that would make the feds respect state laws on marijuana. Do you see that going somewhere in 2014? JA: Yeah, there’s going to be more progress. People are beginning to see that an issue like this should be handled at the state and local level, and that the federal government should stick to subjects that are specified in the Constitution. DW: Are you surprised that this president is so strict on drug laws? We’ve seen photos of him as a teenager partying with the Choom Gang. We know he knows you can smoke pot and be a member of society. JA: Ha, well, I think things will change in the next few years pretty rapidly. DW: After this year’s DOMA decision, do you think the GOP is basically done trying to restrict or ban gay marriage? JA: That was a positive development, because here’s an area that’s not enumerated in the Constitution and it’s not an issue for the federal government to deal with. Whether you’re straight or gay, marriage is not a federal issue. DW: Back to subjects that disappointed people this year. Why did the House finish up without passing a farm bill or unemployment insurance extensions? JA: Look, unemployment insurance has to be reformed. It can’t go on for two years at a time. When we pass a farm bill we need some major reforms that end the large subsidies or phase them out, and the new bill—which hasn’t passed yet—will do some of that. It’ll eliminate some of the 1940s laws, but it adds new provisions that aren’t very good for the economy. DW: Why can’t Republicans bring themselves to say, OK, we’re cutting food stamps—but we’ll get rid of farm subsidies, because they’re much less needed? JA: I’ve said this many times: It sends the wrong message when our legislation is cutting welfare for those that are in need while providing subsidies to people who are quite well off. DW: That’s probably enough about disappointments. What was the best day you had in Congress this year? JA: Not striking Syria was a highlight. The NSA debate was the biggest highlight. Republicans and Democrats came together and stood on the House floor against their president and their leadership to make the case for protecting civil liberties. If you talk to people who were part of that debate, almost all of them will tell you it was a highlight of their entire time in Congress. DW: Speaking of that, I suppose you noticed that your primary opponent made fun of the idea that you, or any congressman, should explain his votes by determining whether they were in line with the Constitution. He said the courts were there to sort that out. JA: Yeah, I did. That’s an embarrassing quote and nobody in the country can hope to be elected in a Republican primary if that’s his or her view of the Constitution and Congress’ role. DW: And despite that, you don’t regret passing up the U.S. Senate race? JA: Oh, absolutely. Republicans have a great shot at winning the Senate seat but I’m happy being a representative from the third district. I like getting the chance to get back and see my family on a regular basis. If you’re a senator you have a lot more territory to cover. No, I’m comfortable with the decision, and we’ll come away with a big victory in the primary in August. DW: This despite the year starting with you being removed from the budget committee and voting against Boehner for speaker. JA: I feel like I have a good relationship with leadership. They understood where I can add to what they’re doing and I think they’ll utilize me more in the coming years. I think they recognize there are more and more Republicans who are leaning libertarian and that I represent a larger and larger chunk of the party. If we’re going to work together, the Republican Party has to welcome everybody, it has to welcome young people, it has to welcome libertarians. DW: Finally, and most seriously, you’ve talked before about your enjoyment of video games. What was the best game of 2013? JA: I’ve played Bioshock Infinite a bit—that’s my favorite game of the year. I love the way it alludes to some of our founding figures, and if you’re a history or a politics wonk it adds to what a great game it is.